Map suggestions, ideas and drafts... They all start life on the Drawing Board. Special Features: Incorporates the complicated geopolitical issue of Palestine and advances gameplay strategy by utilizing Gaza, an isolated region even though it is still part of Palestine. What Makes This Map Worthy of Being Made: Simply put, its a new map that's fun to play on and provides a new geographic region (although middle east is available it spans turkey to egypt to saudi a arabia to russia and is much broader than this. israel is only a single territory). It modernizes Israel and advances the ancient map. Last edited by andrewmac32 on Fri Jun 23, 2017 12:23 pm, edited 2 times in total. 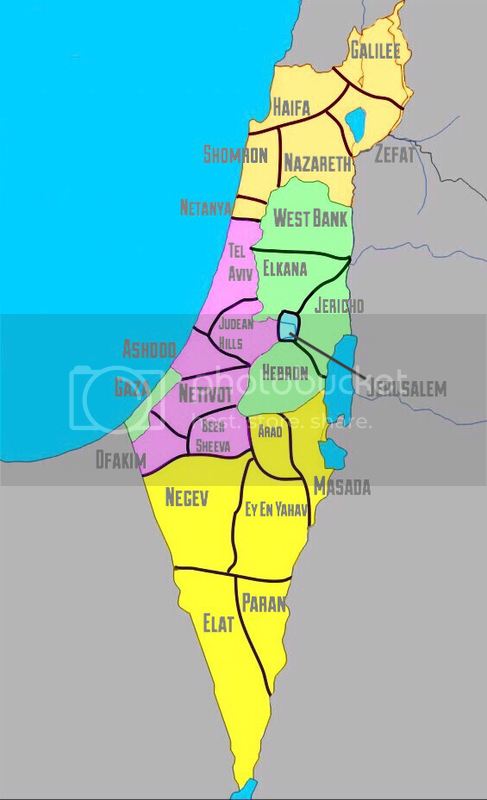 There is a Israel map already (tribal wars - ancient Israel) so I wouldn't call it a new geographic region. I like it, pls proceed. The Sea of Galilee should be in Galilee. Change 'Zefat' to 'Galilee', and change the old 'Galilee' to 'Golan' or 'Dan' or maybe 'Hermon". Also include Sinai, Jordan, Syria and Lebanon as non-bonus territories. If you really want to add complexity you could put some kind of hop connection to Foreign Arms Deal 'Territories around the edge of the map. (U.S., Russia, EU, Iran, etc). Location: My pyramid in Asgard, beside the glaciated Nile. Since Zefat is a subsection of Galilee I think it's appropriate to keep the regions as they are, although I thank you for your response. As for the suggestion about Sinai, Jordan, and the others I feel this would not work with the map because the whole idea is to have a map of Israel & Palestine, not a map of middle eastern countries near Israel. Thank you for your time and input though! Seems like a needlessly offensive map suggestion to me. Making maps about wars and military disputes that are currently happening, or about lands and their peoples who are currently suffering is a recipe for argument that the site has other avenues for debate over. Given that you posted this after a mod locked your previous near identical thread, I think you want an argument. Maybe post in the forums where the debate you want can be found? No, my ideas improved the map and they should be incorporated. Following what I decree or sucking are the only two options available to you...and all mankind. Symmetry wrote: Seems like a needlessly offensive map suggestion to me. Making maps about wars and military disputes that are currently happening, or about lands and their peoples who are currently suffering is a recipe for argument that the site has other avenues for debate over. You misunderstand me. I'm new to conquer club and this was my first time posting to a forum so I'm assuming it was a duplicate error on my part. This map is not meant to be offensive. I find it hard that you could perceive it as such, for cartography is not a subjective business. I seek no argument only to make a new map. The way its portrayed is the way its been for years. Israel holds the sea bordering land (save the Gaza strip) and Palestine holds the easternmore land. Thorthoth wrote: No, my ideas improved the map and they should be incorporated. Meh- the previous discussion was locked, this just seems like taking advantage of the previous mod being offline. 'Locking' a discussion that people still want to discuss shall always be an exercise in futility. I like the overall idea... We have the operation Iraqi Freedom map and no one got mad about that as far as I am aware. How about expanding Jerusalem to be a larger area with a few territs (like the western wall, mount of olives, I do not know much about Areas inside Jerusalem.) it could be similar to the California map where L.A. And SanFransisco have an inside view with multiple territs. Also, I think that Gaza should be at least 2 territs. Maybe you could include a bit of the Sinai Penninsula as a neutral area since it is so interconnected. How old does a conflict need to be before wife can create a map of it? You are new here. You will get the hang of things as long as you stay away from the High-School Drama BS and just enjoy the game. BTW ... Want to play a game? I am up! TotoroHat has a good suggestion about showing Jerusalem as an inset, like LA and San Francisco on the California map. I also agree with Thorthoth's suggestion of adding the border regions of Lebanon, Syria, Jordan, and Egypt as neutral (non-bonus) territories. Jordan and Egypt could each have 2 or 3 border territories, since their borders are bigger. About maps based on current conflicts: It shouldn't be a problem for players if they have no axe to grind. I play on another *Risk*-type gaming site that has a few maps that are deliberately based on current or recent political/military conflicts -- Ukraine, Syria, Libya, and Venezuela. I think such maps are even educational, if they are geographically accurate. I have several considerations on this topic. I graduated from the university with a major in general history and wrote a dissertation on The strategy and tactics of Israel with regard to the Palestinian problem at the turn of the twentieth century. The Palestinian problem became the dominant not only of Israel's foreign, but also of its domestic policies, and the justification and justification of the expansionist course in the Palestinian direction is a priority task for the leaders of this state. Here we learned Sym has been sabotaging decent maps for a while. Wow, it is very nice. I would like to visit there. But now I have much homework tasks which I must do it. If I Mod edit (dk) spam link removed we can visit interesting places, because I don't spend my time on boring homework. Now we learn that this was a thread and map idea that the mods constantly would have to intervene in. I like this map and I think it's okay. No ideas on how to make it better. By the way, if you interested in geography you can find useful articles on Mod edit (dk): spam link removed. AmandaMorgan wrote: I like this map and I think it's okay. No ideas on how to make it better. By the way, if you interested in geography you can find useful articles on(). Oh, Amanda! You look so pretty. Sadly, linking to commercial spam is verboten on this site. Get this map quenched so we can play against spam bots. Someone might want to remove the link in AdamWilson90's signature.